Chevrolet showed off its latest racing tribute to the Dead Milkmen and the gods of speed today, and it looks so good. 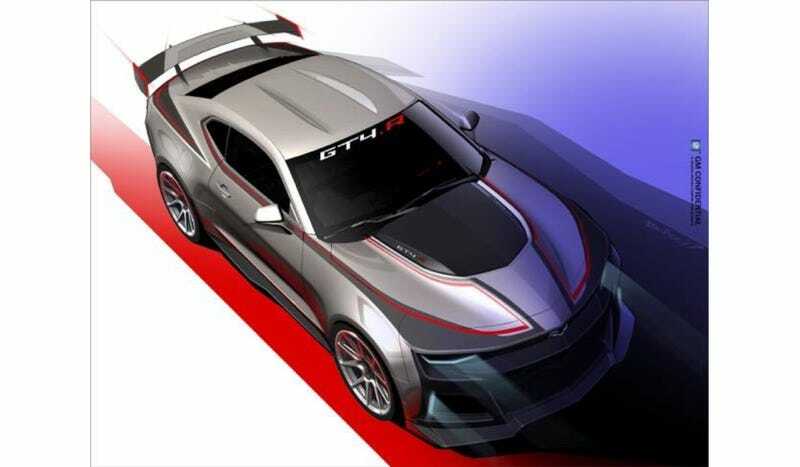 The new Camaro GT4.R is based on the 2017 Camaro ZL1 road car, per IMSA, and it packs a gigantic 6.2-liter LT1 small block V8 engine that can roast tires on demand when the race is over. Pratt & Miller—the same bunch that helped the previous CTSCC Camaro race car go so fast—developed the new GT4 along with Chevrolet. Its race-tuned LT1 V8 is dry sumped and feeds into a six-speed sequential Xtrac transmission that powers the rear wheels. Pneumatic paddle shifters control that trick transmission, which also comes with adjustable traction control to keep it all out of the wall. A limited-slip Xtrac differential and two-way adjustable Ohlins Racing coil-over dampers help keep that power on the ground. Naturally, it sounds good, too. Chevrolet took the big Lego block that is the Camaro into the wind tunnel as well to develop a new front splitter, front diveplanes and rear wing that help it cut through the air better. Last, but not least, Brembo brakes with six-piston aluminum monobloc calipers in the front help slow it down before it launches off Circuit of the Americas’ Turn 1 like a rocketship. Adjustable ABS also helps save the driver from certain wall shaped doom. The Camaro GT4.R was made for the global GT4 spec used in Pirelli World Challenge’s GTS class and the Continental Tire Sports Car Challenge’s GS class, among numerous GT4 racing series around the planet. Thus, it will be up against cars like the Porsche Cayman GT4 Clubsport, the McLaren 570S GT4 and the Ford Mustang GT4, plus all of the cool, strange lesser known race cars that populate the GT4 ranks. Blackdog Racing is expected to race the car first at the PWC season opener in March, per Sportscar365. Stevenson Motorsports, who won the CTSCC title in 2015 with the last Camaro to compete there, announced today that they will rejoin CTSCC with the new Camaro GT4.R at Circuit of the Americas in May. Why do donuts on your lawn when you can do post-race celebratory donuts on Lime Rock, Watkins Glen, and Laguna Seca? Upgrade.